This session is intended to be highly technical. The details of how the LCC and OpenLCB protocols work will be presented and discussed. This is considered training for anyone interested in the production of an LCC product (professional, kit, DIY, etc…), or anyone who wants to better understand the details of how the LCC and OpenLCB protocols work. Several of the LCC product design pitfalls (to be avoided) will also be presented and discussed. All of the proposed LCC protocols go through a period where they are available for public comment. This session provides good background and training for anyone who is wishing to review proposed LCC standards ahead of adoption by the NMRA. This clinic shows the practical side of LCC, and familiarizes the audience with the products, wiring, and tools needed to set up a layout. We will do this in the most pragmatic manner possible by walking in the door with a box of off-the-shelf components and wires, and walking out with a functional layout section. We’ll set up basic layout control like throwing turnouts, fascia panels, and JMRI control, as well as more advanced features like block detection, railroad crossings, and ABS signaling. Basic principles of signal control, where do existing methods and systems fit in. Some benefits of using LCC for signaling. What capabilities are available in today’s LCC signal hardware. Some examples of implementing ABS signals on a simple layout. Demonstration of a working LCC layout with the latest products including a working LCC compatible DCC command station and working LCC signaling and turnout control. This is about a collaborative effort between several private individuals and an established model railroad electronics manufacturer attempting to bring to market an innovative throttle that is compatible with the newly established LCC standards as well as interoperable with non-LCC control systems. All aspects of the design effort from mechanical and user interface to software implementation will be discussed. This is intended to be a fun, high level overview with broad appeal to a wide variety of participants including those with little or no technical expertise. The OpenLCB group is a research and development organization of volunteers that develops communication standards and protocols for model railroad control. Once an OpenLCB standard has been developed and vetted through multiple prototype implementations, it becomes a candidate for adoption into the accepted NMRA LCC standards. The acceptance process includes a comment period that is open to the public. The purpose of this meeting is to present to members of the public the work that is ongoing within the OpenLCB organization. One of OpenLCB’s goals is to be thinking many years into the future in terms of model railroad control technology. During this meeting the public has an opportunity to provide feedback as well as propose new ideas to be investigated. This meeting also provides an opportunity to meet some of the individuals behind OpenLCB and LCC, as well as a networking opportunity for those individuals who would like to become more involved as volunteers themselves. The discussion will be both technical and non-technical. This session is intended to be a discussion, and audience participation is highly encouraged. 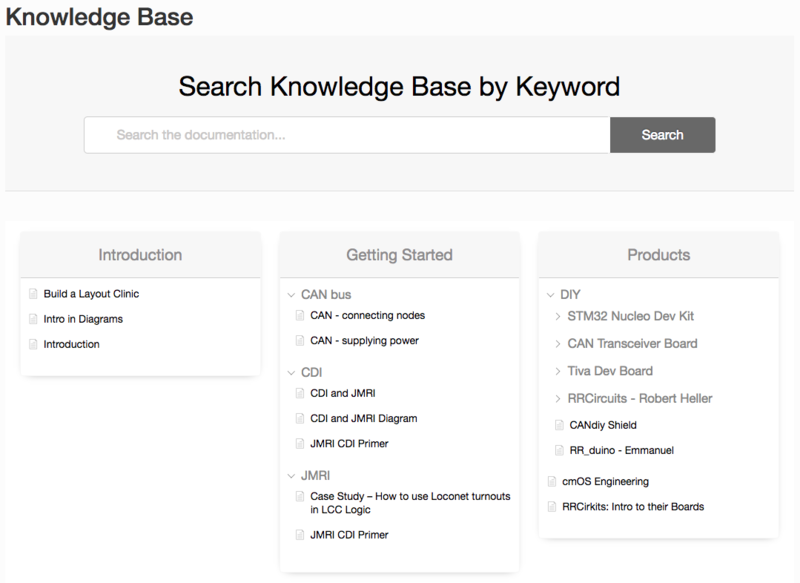 Checkout the new Knowledge Base that is being built. Articles are being contributed by the OpenLCB / LCC User Community but special thanks goes to Paul Davidson and David Harris who have contributed the initial set of entries. Feel free to contribute entries especially for concepts, key learnings or issues that took you a while to sort, that you can pass-on to others. The 2016 Introduction to Layout Command Control (LCC) presentation given at the NMRA 2016 Convention is now available here. It contains the latest information on LCC and also includes a significant period of Q&A from the audience. The OpenLCB Group are pleased to announce the LCC Standards and Technical Notes (Download ZIP file) have been Adopted by the NMRA BoD at their February 2016 meeting. This represents the first complete and coherent set of standards and technical notes to enable manufacturers to develop LCC products. This is the culmination of many (hundreds) hours of work from the core members of The OpenLCB Group and many other volunteers proof reading, checking technical details, providing feedback and prototyping designs to prove the protocols work as intended, in the real (model) world. Many thanks to all those who contributed. The OpenLCB Group are pleased to announce the latest set (2016-02-06) of LCC Standards and Technical Notes (Download ZIP file) are ready for Adoption by the NMRA BoD at their next meeting. This provides a complete and coherent set of standards to enable manufacturers to develop LCC products. We have also published a subsequent set (2016-02-08) of LCC Standards and Technical Notes (Download ZIP file) that are ready for public comment. This set adds DCC Signals on pins (4&5) to S-9.7.1.1-CanPhysical & TN-9.7.1.1-CanPhysical and also introduces the Node Firmware Upgrade S-9.7.4.4-Firmware-Upgrade & TN-9.7.4.4-Firmware-Upgrade capability.